The candidates should possess three years Diploma certification with minimum 55 % marks in Mechanical/ Electrical (EEE)/ Electronics & Communication Engineering (ECE) from a Govt. recognized Institute/University. Age not exceeding 28 years as on 01-08-2016.
a. 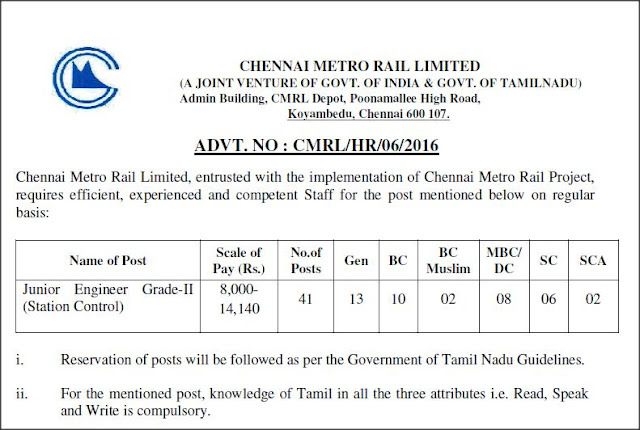 Candidates applying for the position in “Chennai Metro Rail Ltd (CMRL)” are required to apply only through the CMRL website: http://chennaimetrorail.org. No other Means/Mode of application will be accepted. b. Before the final submission of the\online application the candidates should have scanned their recent (a) Photograph & (b) Signature in CD/DVD/Pen drive as per their These documents will be required for uploading and final submission of Online Application. c. A valid E-mail and mobileNumber is mandatory for the submission of Online Application. This EMail and Mobilenumber should be kept active till the declaration of results. 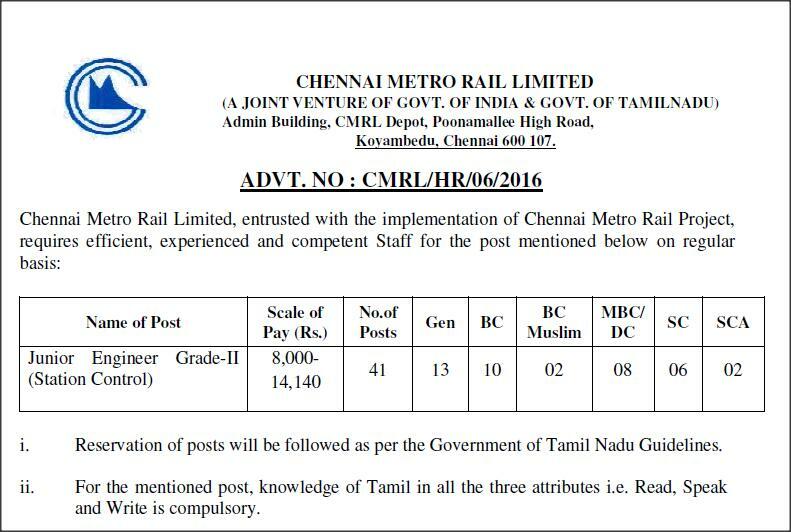 CMRL will send important information with regard toapplication and examination on this registered E-Mail/Mobile number. d. Please note that after the final submission of all the particulars mentioned in the online application including Name of the Candidate, Position Applied, Category, Date of Birth, Address, Email ID etc. will be considered as Final and NO further modifications will be allowed/entertained. e. CMRL reserves the right to either conduct the online examination in single shift or in multiple shifts. f. After the final submission of the online application, candidate will not be able to edit/delete any fields of the Online Application. Candidates are hence requested to fill in the online application form with the utmost care as no correspondence regarding change of details will be entertained at later stage.